Maternity Leave – Will I get it ‘right’ this time? In terms of work/life/childcare balance, this last year has been the best I’ve ever had it since having children. When Rory started preschool, it was the first time I’d had regular childcare for both children. Before then, I always had either one or both of them with me at all times, and all work had to fit in around them. At first, I’d get two hours to myself. And then when Rory adjusted to his new routine at preschool, he started doing longer days, so for two days every week, I get four hours to myself. It is amazing. I have uninterrupted time to work. To go for a swim. To have a haircut or a wax. It’s no longer a battle of schedules and closing times to fit this sort of stuff in. Work is no longer dictated by nap times, which were always unpredictable at the best of times. The work/childcare balance has been perfected even more this year by me cutting down on my workload quite drastically. With Sam’s ever-changing work trip schedule, and the further impact ME being absent at the weekends had when he was around, I finally accepted that I couldn’t book in as many photoshoots for my photography business. My once-upon-a-time plans to really go for it with my portrait photography have now become more of a hobby – fitting in the occasional photoshoot when I know I can make it work, but not overstretching myself and stressing out about childcare any more. And I’ve realised I LOVE IT like this. Looking back at the last few years when I was trying to do EVERYTHING all at once, it’s now clear that I was burnt out. I was horribly stressed, and it never felt like there was enough time for everything. Never felt like I was doing a great job of anything because I was pulled in so many directions, most of the time doing it all by myself as Sam’s trips away are so frequent. I shrugged it off by telling myself “This is just life with young children”, “This is just how it has to be if I want to be successful”, “We need the money”, etc. But I couldn’t make it all work without making myself deeply unhappy. When Sam began to earn more money, I suddenly had a choice. I could step back with my work if I wanted to, it was no longer necessary, but just something I could do if and when I wanted to, purely for the enjoyment. I haven’t been able to make a choice like that that purely concerns my own enjoyment since I got pregnant with Arlo six years ago. At first, it felt a bit wrong. Women and mothers all around are celebrated for their hard graft and multi-tasking, for doing the seemingly impossible and wrangling children as well as busy jobs, for being a #mumboss. And here was me, claiming stress and exhaustion and unhappiness and just wanting to slow down and be ‘just a mum’ for a bit. But it’s been the best decision. I am still working, but at a much more relaxed pace, and it shows in my renewed enjoyment for my writing and my photography. I have more time for the children, when Sam is away, they have one dedicated parent, instead of one parent constantly splitting themselves in different directions. Free weekends are free weekends, not ones where I have to shut myself away to work. Our family needed this. Over the last five years, I’ve spent many a time wishing we had money to pay for childcare, wishing I could dedicate more time to being a mother and also to my work, not trying to do both at the same time, but having scheduled time for both. We’ve finally reached a stage where I can say I am 100% happy with my work/life balance. It’s just a shame that sadly, it’s all attributed to having that little bit more money. I’ve said before that having the financial freedom to make choices that best suit your family is a huge privilege. In a world where we are taught to focus on the fact that money won’t make you happy, and to not really even talk about money in relation to quality of lifestyle, I am not ashamed to admit my unhappiness and constant worry when we were stifled by a lack of money, and how different life feels with just a tiny bit more financial freedom. With another baby arriving next month, I am about to embark on yet another “maternity leave”. And it’s got me reflecting on my previous maternity leaves, which were both vastly different from each other, but neither of which I particularly look back on as a happy time. Maternity leave with Arlo was probably my most traditional. Weekly NCT group meet ups kept me busy for a while, and I’d make an effort to go to the free baby groups at the children’s centre. But we had literally no money coming in. 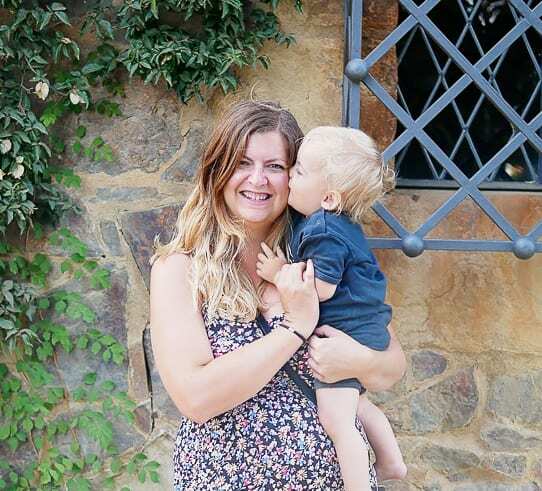 We were not only adjusting to living off one income, we were adjusting to budgeting as a household – only three weeks before Arlo arrived, we had separate incomes and budgets entirely as we weren’t even living together at that point. Sam’s wages and my child benefit just about covered our bills and we had a strict £40 per week food/nappies/household budget. For a few months, I had a tiny bit of “pocket money” in the form of the child tax credit I received, but when the government cut that, gone was my budget for emergencies and socialising. In order to make myself “helpful”, rather than just stuck at home with the baby, I made it my mission to not spend a penny more than necessary. My worst nightmare was meeting up with friends and being ambushed with the suggestion of a cafe stop or a pub lunch. There was no overflow for such occasions, no money in my bank account. We couldn’t join in with baby swimming classes or anything with a termly fee. I became really stubborn about not getting public transport to cut costs, so Arlo and I were very much restricted to our little neglected town of boarded up shops and nothing much going for it. We’d go to the library and the free children’s centre, but otherwise, I’d mainly just wander around aimlessly with him in the pushchair. Summer was lovely, winter was harder. Maternity leave life was entirely ruled by our circumstances, and looking back it’s easy to see how this became begrudgingly obsessive. It’s only in recent years that I’ve started being open about this, as at the time it just seemed depressing and embarrassing and I didn’t want to bring people down with my tales of woe. Being my first maternity leave, there was also a part of me that wasn’t sure if this was not what it was like for everyone. Fast forward to maternity leave with Rory, and things were different once again. I’d started earning a decent income through blog work, commissioned writing, and also through my photography business. But we relied on that income to keep our outgoings balanced. I’d worked hard to build up my clients and my workload, and I knew it would be damaging to take a break for maternity leave, as it takes a while to build everything up again. So, I just didn’t stop. I didn’t have a “maternity leave” in the traditional sense. I had a newborn and a toddler at home all the time, and I worked around them. I get this overwhelming feeling of sadness at some of the posts I wrote when Rory was a young baby. My hands were relentlessly full all the time, and the stress and anxiety is all there between the lines. If only I could have stopped and enjoyed that time more, rather than relentlessly juggle to make it all work. It DID work, but it was me that suffered. By the end of Rory’s first eighteen months, I was burnt out to the point of numbness, I was plagued with anxiety, and I wasn’t really enjoying being a mum – I’d take any excuse to have “time-off” from the children, and I’d often be daydreaming about scenarios where I didn’t have to be here, with them. Where I could get a break.I wanted to be somewhere else, and in my head, I mostly was. Now, I find myself 36 weeks pregnant with our third baby. I’ll be losing my regular child-free time. My lovely working-from-cafes routine will be no more. It’ll be me and this baby, one-on-one, for at least two years. But I’m excited about it. Because I feel like this time will maybe be the time that I get maternity leave right for once. I don’t have to feel guilty spending money at a coffee shop just to pass the time. With the older two at school and preschool, we have the free time (and the budget) to do baby groups if we want to. If I want to be proactive in getting out more and meeting new people, there is opportunity to do that. Likewise, if I want to have lazy days at home, I will revel in those slobbish and unsocial days this time round, as it’s a choice rather than a not-spending-any-money necessity. I won’t be working like a demon, like I was with Rory, nor will I be spending the whole time worrying about how to make an impending return to work possible, like I was with Arlo. For the first maternity leave ever, I will just be ‘being’. Living in the moment, enjoying my baby, and doing whatever I WANT to do rather than what I HAVE to do. Perhaps there isn’t a way to do maternity leave ‘right’. When you are adjusting to a new life, there will probably always be aspects that can feel stressful, worrying, or just a bit different. But with my previous experiences, I’m definitely feeling better armed this time round. I know how I want to approach maternity leave, and I’m feeling optimistic. I totally get where you are coming from when it comes to admitting that money seems to be the root of our unhappiness, it is mine anyhow. As for maternity leave ENJOY IT!!! Yep, definitely exhausting, but you know what you are in for this time with two little ones – I think being prepared and having realistic expectations makes such a difference.